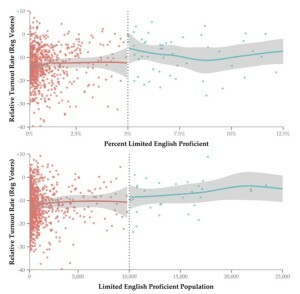 ABSTRACT: The following study investigates the causal impact of the Voting Rights Act (VRA) language minority provisions, which mandate multilingual election assistance if certain population thresholds are met. While lower rates of Latino and Asian American political participation are often attributed to language barriers, scholars have yet to establish a direct impact of the provisions on electoral behavior. Building off of previous state- and county-level analyses, we leverage an individual-level voter file database to focus on participation by Latino and Asian American citizens in 1,465 counties and municipalities nationwide. 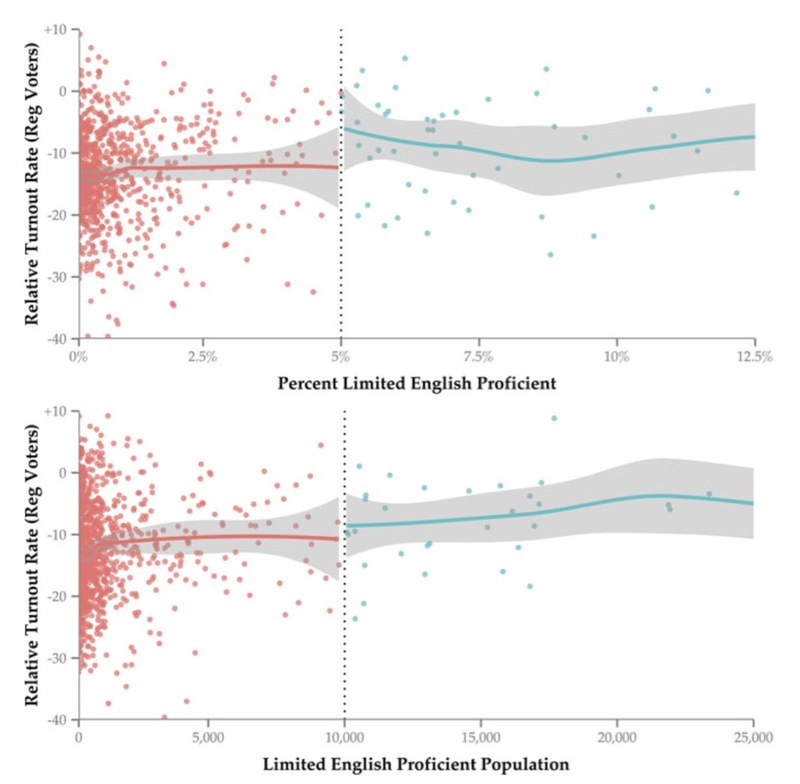 Utilizing a regression discontinuity design, we examine rates of voter registration and turnout in the 2012 election, comparing individual participation rates in jurisdictions just above and just below the threshold for coverage. Our analysis attributes a significant increase in Latino voter registration and Asian American turnout to coverage under the VRA. CITATION: Fraga, Bernard L., and Julie Lee Merseth. 2016. “Examining the Causal Impact of the Voting Rights Act Language Minority Provisions.” Journal of Race, Ethnicity, and Politics 1 (01): 31–59.